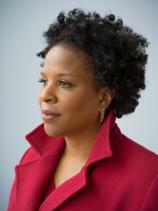 Tayari Jones’ fourth novel, AN AMERICAN MARRIAGE, has been selected as Oprah’s latest Book Club pick, cementing its place as one of the first true must-reads of 2018. The book really is a near-perfect choice for Oprah’s discussion. Not only is it fun to imagine what part Oprah herself might play in the near-inevitable movie adaptation of this highly cinematic novel, but the book has at its heart some deeply complicated moral questions with no easy answers, making it ideal for rich and spirited discussion. The couple at the center of Jones’ stunning new book are Celestial and Roy. The two met while students at historically black colleges Spelman and Morehouse in Atlanta. Celestial, a lifelong Atlantan, transferred to Spelman after a devastating freshman year at Howard University. Roy, who grew up in tiny Eloe, Louisiana, aspires to life in the big city. After a less-than-auspicious initial meeting (Roy lived in a dorm room adjacent to Celestial’s lifelong best friend and next-door neighbor Andre), the two reencounter one another in New York City after graduation, while Roy is there for a business trip and Celestial is waiting tables to make ends meet while she attends graduate school in fine arts. 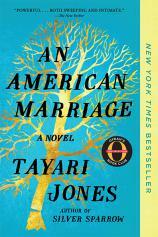 "AN AMERICAN MARRIAGE is a novel that manages to be both epic in scope and deeply, at times painfully, intimate, giving readers vivid characters, dramatic situations and profound questions that will stick with them for a long time to come." The rest, as they say, is history. As Roy narrates in his buoyant introductory chapter, “We were happy…. Maybe we didn’t do happy like other people, but we’re not your garden-variety bourgeois Atlanta Negroes…. I was young, hungry, and on the come-up. Celestial was an artist, intense and gorgeous. We were like Love Jones, but grown.” After a year and a half of marriage, the couple seems poised for whatever life throws at them; they have good jobs, good friends and a house in the suburbs. They’re making plans to start a family. And then, on a trip back to Louisiana to visit Roy’s parents, everything changes. A chance encounter results in a midnight raid of their motel room and the arrest, and eventual conviction, of Roy for sexual assault. Roy insists he’s innocent, and Celestial believes him, but years into his 12-year sentence, their marriage begins to founder, and Celestial makes a choice that may change everything. With its focus on a racially charged accusation, a wrongful conviction, and the grim realities of incarceration, Jones also writes a novel that is both topical and timely. In prison, Roy encounters a couple of characters whose presence there might at first seem like a far-fetched coincidence, contrived for narrative convenience --- but in fact, given the incarceration statistics among African American men, may be all too conceivable. AN AMERICAN MARRIAGE is a novel that manages to be both epic in scope and deeply, at times painfully, intimate, giving readers vivid characters, dramatic situations and profound questions that will stick with them for a long time to come.